Rarely does a property come along that redefines the art of living: aptly named 'Silicon Gates III’, it is destined to be the most attractive residential address in DSO. An eight- storey building through ultra modern apartment complex with unique features, a world of amenities and facilities for a relaxed and satisfying lifestyle. 'Silicon Gates III' is especially intended for those who do not accept the second best that is why it has been constructed with the most stringent international standards, settling for nothing but the best in everything it has to offer. These strict standards are notably shown inside every apartment from the furnishings and wiring, to the appliances provided. It sets new standards of state-of-the art technology. All this translates into simply the best and safest habitat that you can provide to your family for years to come. AI Derea commitment to high quality craftsmanship in all aspects starting from design, through construction and ending in the delivery will all be reflected in this new exciting residential development. Silicon Gates III is located next to the main entrance main round about in the prime residential area of Dubai silicon Oasis Authority, just opposite the Academic City that is include: Sheikh Zayed University, Knowledge Village, Women College, and few minutes from Dubai Land, and international City. 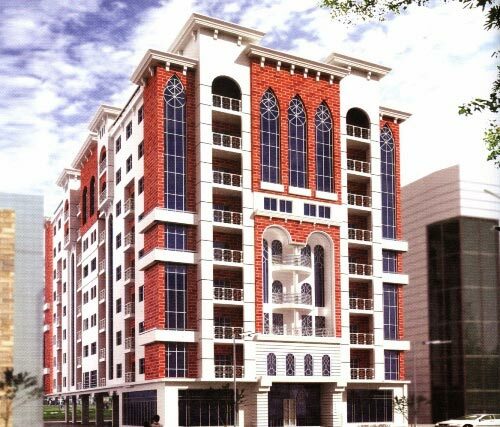 This magnificent building realizes all your dreams, and makes living in Dubai a pleasant and memorable experience. 'Silicon Gates III' is a magnificent eight-storey, five-star apartment building designed according to the same high standards of its sister buildings located less than 2 kilometres away from Silicon Gates I and Silicon Gates II. ‘Silicon Gates III’ will contain spacious reception areas welcoming all its visitors. Each level has been designed to reflect an ambient setting that leads to an overall feeling of peace and tranquillity. All apartments have been carefully designed to make the best use of light and space. Moreover, the highest standards in building materials will be applied and used, to complete these apartments with a quality finish you will be proud of. Each floor will compromise a mixture of studios, one, two and three bedroom apartments. Most apartments will include a vast balcony, and all of them will have their own secure designated basement car parking lot. All apartments will include matching fitted wardrobes, high quality kitchen cupboards and carefully selected bathroom sets. The solid wooden doors throughout the apartment add to the overall quality finish guaranteed by the developers. On the top floor of the building, owners will have an exclusive use of the rooftop swimming pool, health club and spa. The generous terrace space allocation enables you to sit back and relax in the sun or enjoy the stars on a calm evening after witnessing yet another fantastic sunset across the desert landscape.